Located on the rim of the crater, the Meteor Crater Visitor Center is the gateway to discovering the wonders of the best preserved meteorite impact site on the planet. The fully air-conditioned modern building features an 80-seat widescreen theater, indoor crater viewing area, crater trail access, interactive discovery center, artifacts and exhibits, gift shop, and Subway restaurant. Elevators and ADA accessibility at the Visitor Center entrance are available for guests with special needs. Visitors are encouraged to begin their Meteor Crater adventure by enjoying a 10-minute movie which explores the origins of Meteor Crater and focuses on its value as a living geological and astrological laboratory. "Collisions and Impacts" --shown twice each hour--allows viewers to sample the wondrous sound and explosive fury of the meteor's super-heated trip through the Earth's atmosphere and ground-shaking collision with the Earth in Northern Arizona. Visitors may then choose the view the crater via the air-conditioned indoor viewing area or venture out on the crater's rim on one of several self-guiding observation trails. The trails include interpretive signs plus observation telescopes for a closer look at the details of the huge crater and artifacts left from human exploration. Hang around for a guided rim tour guide at various times of the day. 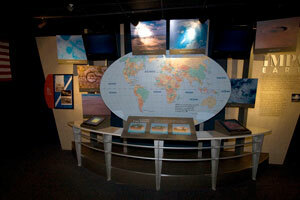 The Visitor Center's Discovery Center is the most extensive interactive display of meteor impact science of its type in the world. It includes guest-generated computer simulations, a meteorite fragment weighing over 1400 lbs. ; artifacts from early exploration and scientific study of the crater; high-tech graphics of space, meteorites and asteroids, and solar system; plus exhibits from Apollo astronaut training and meteor collisions worldwide and on other planets. Meteor Crater's friendly and fascinating gift shop offers a wide variety of gift and souvenir items from fossils and dinosaurs to astronauts and spacecraft. Focusing on the unique Meteor Crater experience, gifts and souvenirs include Native American and gem jewelry, authentic fossils, astronaut ice cream and mission patches, space toys, games, postcards, space and geology science kits, books, home decorations, and Meteor Crater t-shirts, sweatshirts and hats. The Subway sandwich shop restaurant in the Visitor Center offers lunch, snacks and soft drinks with indoor seating for the whole family. An Actual Apollo space test capsule and American Astronaut Wall of Fame are the highlights of the courtyard outside the Subway and gift shop. The Meteor Crater Astronaut Memorial Park is a perfect place for a Subway sandwich picnic, as well as an opportunity to sample the weather and unique beauty of Northern Arizona's high desert plateau. 50,000 years ago a fiery giant meteor mass weighing several hundred thousand tons hurtled through space and impacted earth. The Crater’s diameter reaches 4,100 feet (1.2 km) with a depth of 570 feet (173 m). The rim’s height above the surrounding plain is 120-200 ft (36- 61m), with a total volume of 82,000,000 cubic yards (62,700,000 cubic meters). 300-400 million tons of rock were displaced by the impact (272-363 million metric tons). The highest point on the rim is 5,723 feet (1,744m) above sea level. Guided trail tours of the rim are offered, weather permitting. Allow 1-hour minimum. Tours depart hourly between 9:15 am to 2:15 pm. Visitors will relive the the intensity of this impact. The wide range of exhibits will fascinate and educate every person on the aspects of meteors and their encounters with the earth. 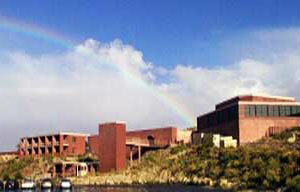 Twenty-four exciting exhibits, making it the most extensive and informative discovery center of its type. 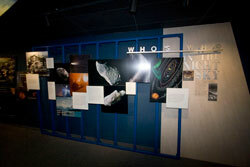 Two interactive computer displays that contain information and high-tech graphics on space, meteorites and asteroids, the solar system and the Shoemaker-Levy 9 comet that impacted Jupiter. 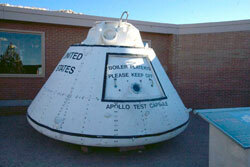 Actual Apollo Test Capsule with viewing window showing Astronauts cramped quarters. Admission prices include 3 lookout points on the rim of the crater, an Interactive Discovery Center, a theater showing our movie "Collisions and Impacts" as well as a guided tour on the rim of the crater. We are sorry to say that pets are not allowed.